If you walk in the garden early in the year and get hunger pangs for a cookie or cardamom bun, that’s could be because you’re near a Sarcococca ruscifolia. Our Plant of the Month person, Rhonda DesVoignes said the flowers are very fragrant in January and February which are followed by red berries that turn black. Plant Sweetbox near doors and walkways so the fragrance can be enjoyed by visitors and family. 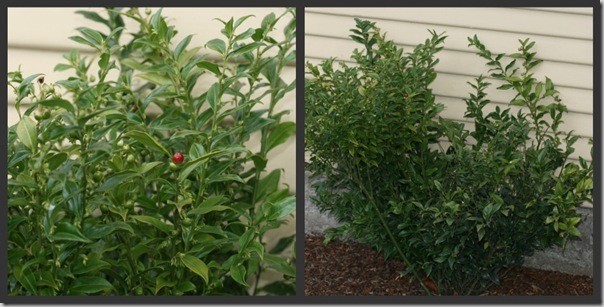 The Sweetbox, an evergreen with shiny leaves, is originally from China and does well in zones 7 to 9. It likes dry shade – no hot sun between 10 a.m. and 2 p.m. It requires very low water, so plant it a little high and only use light mulch kept well away from the crown. If a cold snap occurs, the foliage may fall off, but will grow back in the spring. It’s great for foundations and woodland gardens and will form a natural espalier when planted against a wall. Deer are not attracted to this plant. Bee Alive Bidens, mounding and smothered in bloom from spring to fall and great for containers, hanging baskets and bed planting. Skyscraper Pink Salvia, new plant in 2018, outstanding in containers, takes more shade than other salvias, long bloom with big flowers on a fairly compact plant. Both these perennials are pollinator magnets and like the heat, Rhonda said.